There have already been reports about the breeding efforts concerning the lyretail platies (Xiphophorus maculatus) (Gentzsch 1982). Inspired by some foreign literary sources I have intended for some years now to introduce once again the breeding history of the lyretail platies, which has been shown on exhibitions since 1981 almost every year. The reprint of an article by Norton (1972) about the breeding of lyretail platies in 2002 has now induced me to do so after all. 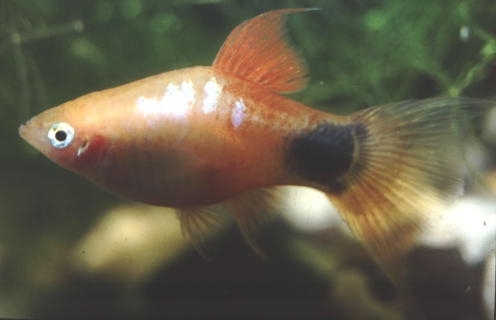 „…To date this characteristic has been limited to swordtails, no one having been able to breed a lyretail platy, but it is merely a matter of time, probably, until a similar trait shows up in platies.” Quite obviously, the above standard works must have also disregarded the article of Norton (1972). As it so happened, the lyretail platy has been regularly exhibited at exhibitions organized by the work group Livebearers since 1981 (anonymous 1981-1989). The performance shows now organized by the DGLZ after the re-unification of Germany continue to focus on these efforts. At the International Performance Show for Livebearers, organized by the GGD in Bretnig-Hauswalde on 19/20 October 2002, 93 pairs of cultivated xiphohorus forms were exhibited. The prize-winners were a pair of lyretail platies. We must thank Dr. Mathias Trauzettel, Andreas Wölfer, Dieter Schöne, Günther Schramm and others for keeping this cultivated form alive. 1. 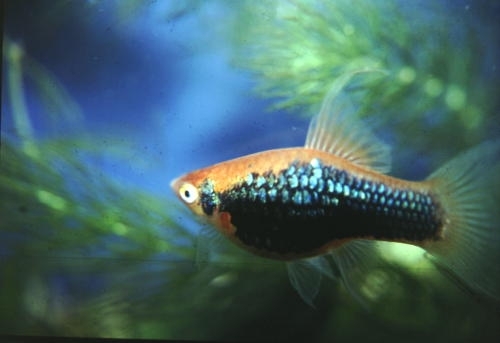 The activities were aimed at breeding a lyretail platy. 3. The feature of the lyre-type fins will be dominantly hereditary. 4. As soon as the cross-breeding between X. helleri and X. maculatus with female lyretail descendants has been accomplished, male platies had to be back-crossed so as to consolidate the platy type as soon as possible. The table below summarizes the history on the way to breeding a lyretail platy. All animals not used for further breeding have been disregarded for simplicity's sake. The percentages reflect the calculated proportion of the hereditary factor H and M.
In 1978, the attempts to breed with six virgin HLr or HLc females, respectively, and five MNr or MNwr males, respectively, lasted more than half a year and failed eventually. The next step was therefore to initially breed bastards with normal fins from an HNr x MNwr crossing which, of course, extended the breeding history. The males, and only they were required, were phenotypically very different as far as sword length and courtship were concerned. A male with a particularly short sword was used for the first crossing with 10 virgin HL females. Of the only three fertile HL females (out of 14 L females from later breeds), only one was fertile in four litters with one MNr male. So, this was the first backcrossing on the basis of the platy type. The majority of females gained from the breeding have probably already been fertile with the MN males. The animals most similar to the platy type were then backcrossed with the father (MNr) and two new males (MNwr), and the descendants of the two new males were no less similar to the platy type than the descendants of the father. The lyretail platies, shown for the first time ever at the Ninth GDR Xiphoshow in Nordhausen in September 1981, originated from the litter of 26 April 1981 and were a pair of red lyretail platies (MLr) as well as a pair with wagtail markings (MLwr). The numbers in a litter of lyretail platies are lower than in a litter of animals with normal fins, with an average of only 18 animals being counted in the six litter between 26 April and 7 July 1981 (the numbers in a litters ranged from 8 to 42 animals). It is important to say a few words about the hereditability of the lyre-shaped fins. It has very often been described in the literature about swordtails that the fin shape is a dominant feature, although the percentage of animals with lyre-shaped fins is in most cases less than 50 %. This is probably due to the fact that some of the lyre-determined eggs or embryos die. As far as my swordtails are concerned, I have always been able to clearly distinguish between the animals with lyre-shaped and normal fins. This is not the case with many lyretail platies, as the litter of 26 April 1981 proved: It contained five animals with normal fins and nine with lyre-type fins, although the fin shape of four out of the latter nine were only slightly extended. This shows already that the mechanism to pass on the feature of lyre-shaped fins to following generations is much more complicated in the case of the platy than in the case of the swordtail. Unfortunately, the different fin shapes found in the numerous litters have not been counted exactly, although the aim to breed lyretail platies was more or less attained as early as in 1981. Under phenotypical aspects, these animals are platies, court quite clearly like the X. maculatus and are completely fertile when crossed with platy strains. It has been unavoidable over all these years to select strictly, in order to keep and improve the feature of lyre-shaped fins. It was also important not to make crossings with hi-fins and brushtails, so that this beautiful cultivated form is not compromised and does not degenerate, as it has partly happened with the lyre-swordtail. After having gained 20 years of experience in the field of breeding lyretail platies and in view of the Norton article of 1972 (or 2002, respectively), it seems to be advisable to discuss a few things. This cultivated form has been successfully kept alive with more or less great difficulties over a relatively long period. All animals have originated from the above mentioned breeding line, into which the most diverse colours have been interbred. There have been, and still are, the following colour shades of the lyretails about: red, red wagtail, yellow wagtail, bleeding heart, yellow, tuxedo, black and many more. The selection always had to be very strict. The hereditability of the lyretail fins has not been as dominant as in the case of the X. helleri. There have always been, and still are, numerous transitional shapes between the normal and the lyretail fins. Some years ago, we had some males with good lyretail fins and short gonopodia, but this strain has never reappeared in the following generations. Unlike in the observations of Norton (1972), the gender ratio of most litters was well balanced, so that it was not necessary to look for males with a sufficient number of female descendants. 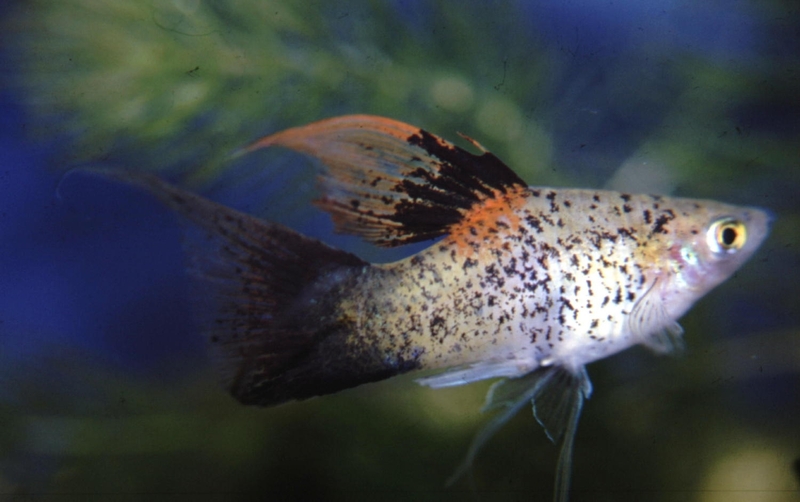 However, it has been observed very often that one litter with a single colour shade consisted of one gender only, as has been the case with platies with normal shapes and genetic defects. 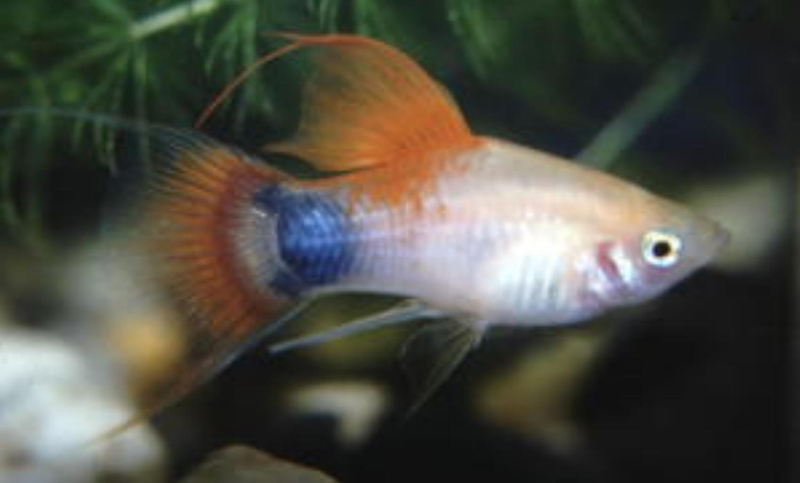 Norton (1972 or 2002, respectively) mentioned several times that hi-finned males have been admitted to interbreeding, which we have strictly refused all the time: Our long-standing experience of crossing hi-fins with lyretail swordtails has shown that this always leads to a poor fin quality. As long as lyretail males cannot be bred permanently with a normal gonopodium, there is no other way but to admit males with normal fins to the breeding. In view of the lower size of the X. maculatus as compared with the X. helleri, it would be advantageous if the lyretail platy had a larger circulation. The main problem at the moment is that a large number of animals only show rudimentary signs of lyre-shaped fins, so that the strict selection will have to be continued also in the future. Anonym (1981-1989). Ergebnislisten der DDR-Xiphoschauen. Axelrod, Herbert R., Gordon, Myron. 1997. Swordtails keeping and breeding them in captivity. t.f.h. Axelrod, Herbert R. , Wischnath, Lothar. 1991. Sworttails and platies. t.f.h. Gentzsch, Dieter. 1982. Die Zucht des Lyratailplaty. AT 29(8): 269-271. Gentzsch, Dieter. 1988. Zucht des Lyratail-Variatus. ZAG Lebendg. Zahnkarpfen (Sonderausgabe) : 20. Gentzsch, Dieter. 1996. Einige Bemerkungen zum Lyra-Platy und Lyra-Variatus. DGLZ-Rundschau 4, 82-84. Kempkes, Michael, Schäfer, Frank. 1998. Lebendgebärende der Welt. Livebearers and Halfbeaks. Verlag A. C. S.
Lambert, Derek, Lambert, Pat. 1995. Platies and swordtails. Blandford. Norton, Joanne. 1972(zit. von 2002). Breeding lyretail platies. Livebearer News 2: 15-18. Wischnath, Lothar. 1993. Atlas of livebearers of the world. t.f.h.